Get a good night’s sleep the night before the test. Get up early enough to avoid hurrying to get ready for school. Eat a good breakfast (and lunch, if your test is in the afternoon). Read each test question and all the answer choices carefully. Eliminate any obvious wrong answers. Solve the problem using paper and pencil, a calculator or by using manipulatives. See if your answer is similar to one of the choices given. Pace yourself. If you come to a difficult question, it may be better to skip it and go on. Then come back and focus on the difficult questions one at a time. 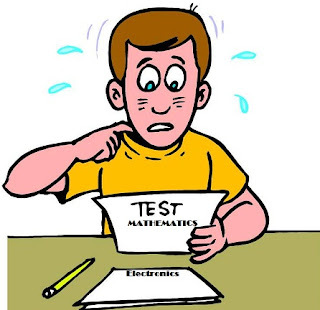 Remember the test questions are not necessarily arranged by difficulty. If you get to a question you think is too hard, that doesn’t mean the rest of the test questions will also be too hard. The ones who write the test questions use “commonly made mistakes” to identify good distractors, so finding an answer like yours is not a guarantee that it is the correct answer. Cross out the answers you know are not correct and choose among the rest. Read through all the answers very carefully, and then go back to the question. Sometimes you can pick up clues just by thinking about the different answers you have to choose from. If you get stuck on a question, skip it and come back later. Your last resort is to guess on the test. Try to make your best guess, but make sure you answer all questions. Before you turn your test in, check it over. Change an answer only if you have a good reason. Generally it is better to stick with your first choice. Make sure you have marked an answer for every question, even if you had to guess. If you have TEST-TAKING TIPS to share, kindly post in a comment box below.